I have an e-friend who is moving from the Great Pacific Northwest to New England. He and his wife are chronicling their adventures in a blog that Kathy and I are enjoying because we have had some of those same types of adventures. A year or so before I retired from the Army, Kathy and I purchased a new vehicle, a 1987 Plymouth Grand Voyager, with seating for 7 people. Kathy and I have one child, and why would we need such a large vehicle? Our daughter was in middle school; fairly active in the church youth program and having lots of friends we figured that we would need a bigger vehicle to accommodate all her friends. 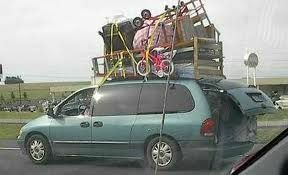 Besides we had planned to retire in Arizona and if we wanted to travel around the state we would need a bigger car. One weekend the youth group was invited to join in a lock-down at a church in Tucson, 70 miles away. Two fathers volunteered to transport the girls to Tucson and I volunteered to pick them up the next morning since I had a bigger car and could do it in one trip. I arrived at the church at the appointed hour and the nine girls loaded their sleeping bags and piled into the van. This was before the mandatory use of seat belts. We had a rule for our daughter, she could ride in the back without a seat belt, but if in the front seat she had to have the seat belt on. You try to figure out how nine girls fit themselves into a space for five. We left Tucson and started for home. Have you ever been in a vehicle with nine tired and giggling girls for an hour and a half and all of them trying to tell you what happened at the same time? It was an experience that I swore I would never do again, but is a memory that I cherish to this day. 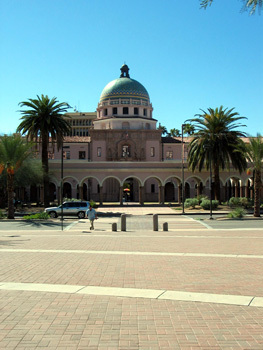 It came time to retire, but instead of retiring in Arizona as planned, we were moving back to Portland, Oregon where Kathy and I had grown up. We made the arrangements with the Transportation Office to have our household goods packed and stored until we found a permanent place to live. Being that we had up to a year to decide were we would permanently settle, we needed to take a certain amount of items with us. This included clothes, dishes, pots and pans, bedding and other sundry items that Kathy could think of. If Kathy could have figured out how to take the kitchen sink, she would have had me pack that too. I packed and repacked the car several times before we left Sierra Vista to accommodate everything, not only was the interior full but also the rooftop carrier was loaded. It was the 19th of August when we left Sierra Vista. We got a good start; the car was loaded and we were heading for Fortuna, California as our first stop. No sooner had we reached Interstate 10 and started west we heard something snap and started bouncing between the road and car. Stopping, I found a bracket under the car had broken, and so I grabbed a piece of rope and I tied it up until we reached Tucson. Finding a dealer in Tucson, we learned that this part helped the brakes compensate for loads had broken because we had overloaded the car and they did not have the part to repair it. They said that if we reduced the load, we should be able to reach Oregon without any problems. I found the Greyhound depot, bought several boxes, packed much of that which we would not be need for a few weeks and shipped them off to my brother in Portland. I repacked the car and we headed for California. Crossing Arizona in the heat of August without air conditioning is foolish; this was the first car we owned that had factory air. My wife, daughter, cat and dog made it, thanks to the AC. On top of this, Kathy was suffering from a case of the shingles. Even though she had medication for it, she was still very uncomfortable. The dog, a black Cocker Spaniel, switched from one side of the car to the other depending upon which side the sun was on. The cat stayed in her kennel for most of the trip, only to come out periodically to sit upon my daughter’s lap. We had gotten her a couple of years before our daughter was born and she (meaning the cat) had adopted her as her own. Our daughter could do almost anything with that cat. We arrived in Fortuna about 4:00 pm that day and checked into a motel. We did not stay there for more than an hour. The door was warped and did not close completely; the room was dirty, as if it had not been cleaned since the last century. We checked out and went to a different motel in a different town, Santa Bernardino. It cost a little more, but it was worth it. The next morning we left San Bernardino for Oakland. Heading north on Interstate 15 until we were outside of Barstow and picked up Highway 58, and proceeded toward Bakersfield. We went through the Mohave Desert which is very flat and desolate; you can see for miles, this is where Edwards Air Force Base is located, where the space shuttle sometimes lands when Cape Canaveral is not available because of weather. In the mountains we passed through Tehachapi a town that brought back memories of comedy programs of long ago – Tehachapi. We arrived in Bakersfield about lunch time. Other than having lunch, I do not remember anything about Bakersfield. After lunch we headed west where we picked up Highway 101 and proceeded to Oakland. Through the dry, rolling hills of central California we saw wind turbines scattered across the landscape. We also passed many livestock holding areas, and held our noses because of the stench. We looked for but did not see any California Condors. Every place we passed we found the beauty that surrounded us at that moment in time. We arrived in Oakland late that day. The next day my daughter and I spent the day touring San Francisco and I showed her some of the places her mom and I used to go when we lived in the bay area. The shingles were taking a toll upon Kathy’s strength. She stayed in the motel taking care of the animals and resting. That evening Kathy joined us for dinner in San Francisco. Our day in San Francisco was filled with sightseeing, riding the cable cars, eating at Fisherman’s Wharf. The day was full and we had fun. Dinner was at one of the many Chinese restaurants in Chinatown. It was dark by the time we headed back to Oakland, and the lights of San Francisco and Oakland were shining, making the skyline amazing. The next day we were starting the next leg of our journey before we would finally settle in Portland. The destination was my parent’s home in Prineville, Oregon, but we needed to stop one more time before our daughter saw her Grandma and Grandpa. We heading east on Interstate 80 to Sacramento, turned north following Interstate 5 to Weed, California. As we left the Sacramento valley and started up through the mountains we enjoyed the change of landscape as we passed by Mount Shasta. We were surprised at how low the water level was in Lake Shasta. At Weed we took a northeast heading going through the high desert and mountains of northern California, this was terrain we were familiar with from Arizona, that afternoon we stopped in Klamath Falls. After a nice meal and a good nights rest we finally departed Klamath Falls at mid-morning. As we drove toward Prineville we passed the cut off to Crater Lake. We discussed making a side trip to the National Park and decided against it to arrive in Prineville in the mid afternoon. We stayed with mom and dad for a couple of days before Kathy and I left for Portland to look for a place to live and get our daughter registered for school. Kathy and I stayed with my brother, who had picked up our stuff at the bus station, and his family. We looked at a lot of apartments before finding one in the Beaverton School District. After signing the lease and establishing a move in date, Kathy and I returned to Prineville to spend time with my parents before school started. Upon our return to the Portland area, we took possession of our apartment; then we had to get some things for furniture. A folding (card) table and folding chairs which would be used for the dining room, the church we started to attend, helped us find used furniture and beds to hold us over until we finally found a house where we would permanently put down roots. 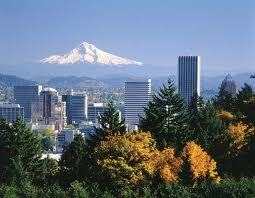 As my years in the Army came to a close, I started a new life and career in Portland, Oregon. Life would now be different from how we lived for the past 20 years. The worry that orders that would direct us to move somewhere else in the world was over. The future meant that now we must depend on my ability to work and learn my new profession.